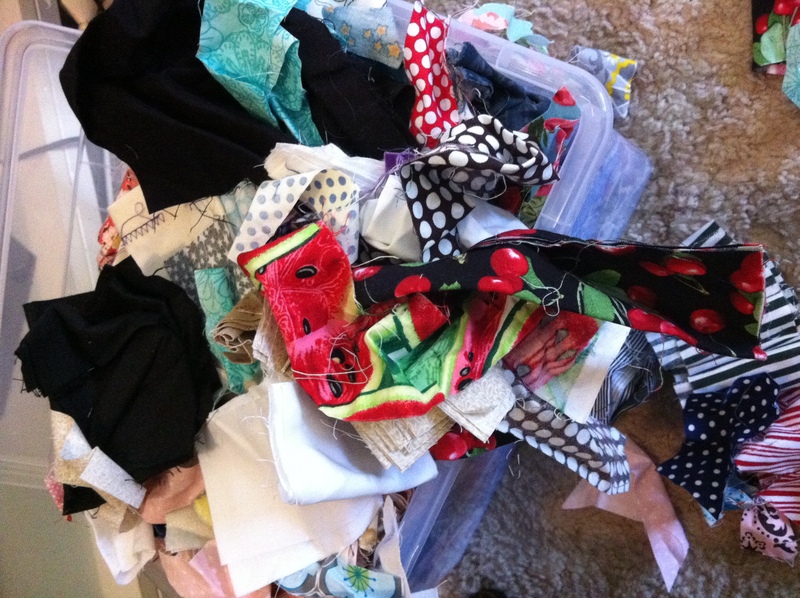 Hexi Fever and Scrappy Memories…. Argh! Hexi Fever has arrived at my house and there’s no cure! 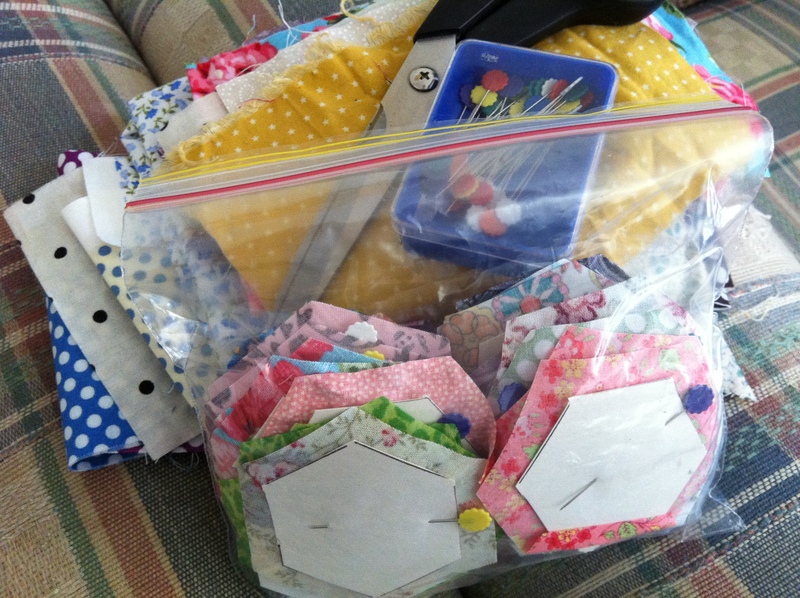 I’ve cut out over 100 hexi’s in the past 12 hours (with more to come!) and have got them ready for some good basting. This, by the way, is all for an unpredicted, self-indulgent and slightly crazy Scrap Hexi Quilt I’ve got in my mind to complete. Who knows why I’ve gravitated to this technique so quick and easily. I think it grabs me as I get to work so finely with my hands, to simply stitch with a needle and thread and finally have a reason to rummage through my scrap tubs – just the thought of it makes me giddy with excitement! Going through one’s scrap tub is like a walk down memory lane. You discover fabric remnants from long past quilts you’ve made for family and friends, tragic remains of projects that went totally wrong along with that once favourite fabric you used over and over and over again only to cast away it’s skeletal remains to the bottom – long forgotten. The projects that you vowed to make one day are trudged back up into focus when you find that one fabric you planned to use. Words like ‘Oh yeah! I totally forgot about that one!’ Or ‘Oh! I used to LOVE this fabric!’ escape from your mouth, eyes wide opened with excitement! Then comes the discovery of the abandoned mistakes. These little numbers are usually hid at the bottom; HST gone wrong, Pinwheel blocks that look more like a Drunkard Path, attempted curved blocks puckered and misshaped and left over applique pieces that didn’t make the final cut. One can learn of the Quilter’s journey from their scrap tub – the years of learning from mistakes, reminiscing over that one quilt that could never be made again, that other quilt that tested your patience like non-other and then there are those special projects that you knew would light up that one person’s life because you made it specially for them. 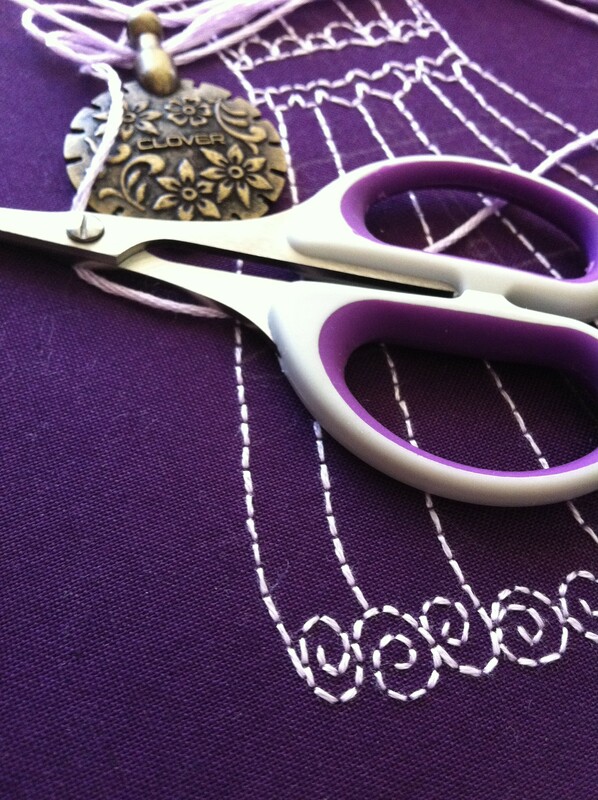 Now that’s the best memory and feeling one can gain as a Quilter…. 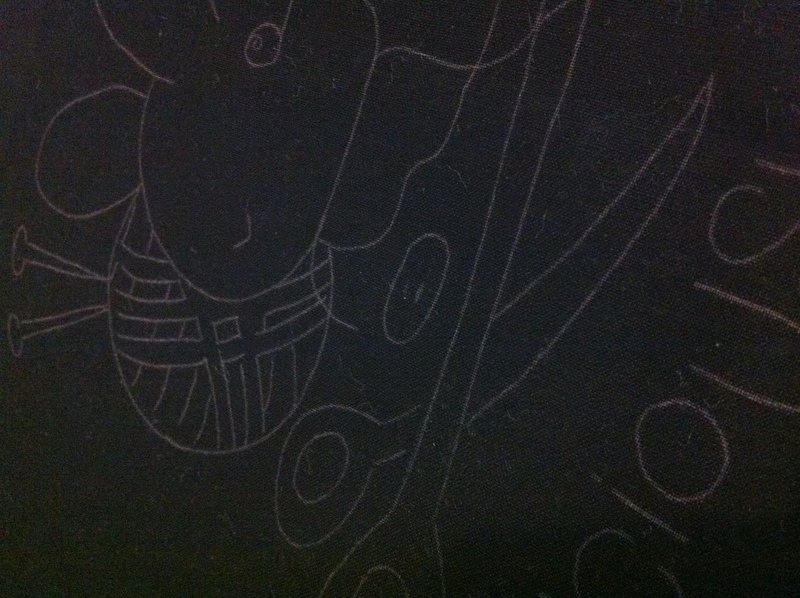 A few sneaky peeks of a few special projects on the way…. First is the Butterfly Cot Quilt I’m making for a friend. This is the central panel or block of the quilt and everything is sort of being constructed from and around it. 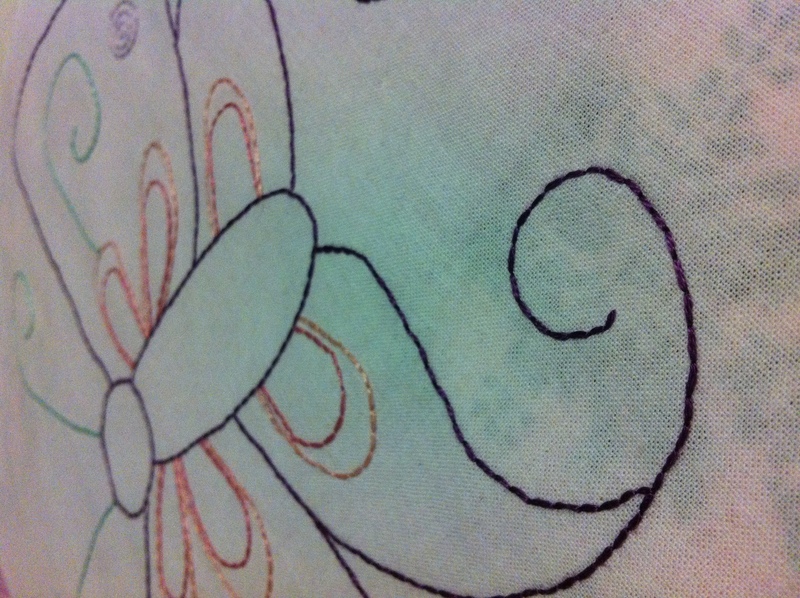 Hand embroidered, the pattern is from an awesome book by Aimee Ray called Doodle Stitching: The Motif Collection. It’s the perfect book for those who want to start stitching cutie little projects for their kids or add some whimsical touches of embroidery to home décor items, clothes or gifts. It comes with a CD-ROM that has all the patterns on it ready to be printed off along with some sweet and easy projects to make. These next sneaky peeks are some Embroidery pieces for a few very special people in my life who have nurtured and encouraged my love and passion for quilting and whom I respect and will miss very much. One is half way completed the other is next! Both designs I found on Urban Threads who have one of the most amazing online libraries of embroidery designs I’ve ever discovered. Plus I just love just how funky and contemporary they are! I have so many designs sitting in my to-do tray it’s not funny! I think I’ll be an old woman of like 96 before I reach the end! Last, but not least, I’m drawing up and finalising my quilt design for an Australian Quilters Guild Quilt Challenge: 2012 Under 35’s Quilt Competition How Does Your Garden Grow. I’m basing it off a beautiful flower I had growing all over the summer months. I was drawn to the colour and lines that this little guy has and plan to make the quilt based around a colour wheel constructed design. Can’t wait to get started! Oh, can’t forget the Regeneration: Contemporary Quilt Textiles 2012 Exhibition starting this weekend! ‘The exhibition showcases some of the best work to be seen in the art quilt world. It will be an opportunity, not only see the finished artwork, but in most cases, to also see the processes used by the artists to achieve their vision and response to the theme ‘Regeneration’, via individual display boxes. This will include the artists’ sources of inspiration, photos, sketches, samples of fabrics and techniques.’ It’s open free to the public from 27 April to 4 June 2012 at the Manly Art Gallery & Museum. Yay! Can’t wait! Can you tell me the name of that flower? We have them in our backyard and I have no idea what it is! I agree with your comments on the scrap tub. Whenever I dig through my scraps, I find old friends. For me it’s a little bit like decorating the Christmas tree…all the ornaments have a memory attached and in a way, so do my scraps! 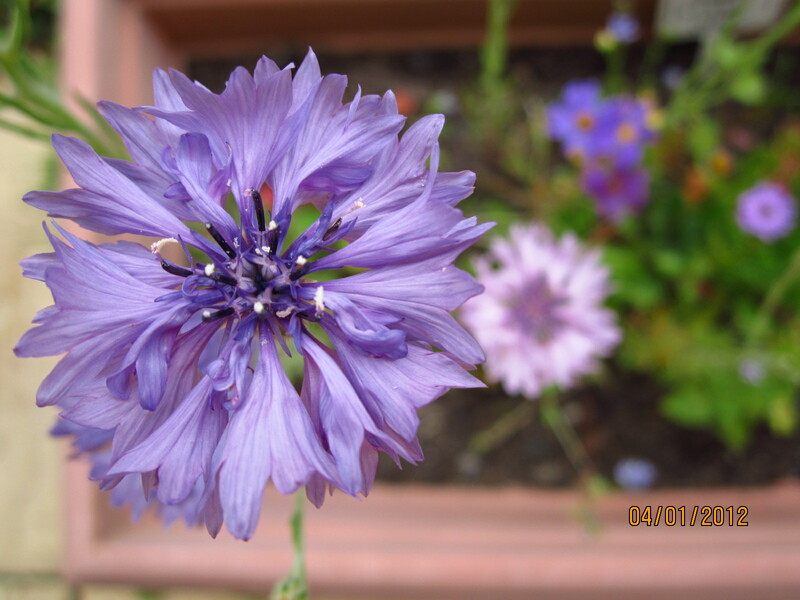 I’m sorry I have no idea what flower type of flower it is either – it came in a mix seed packet called ‘Shades of Blue’….They are beautiful flowers though!